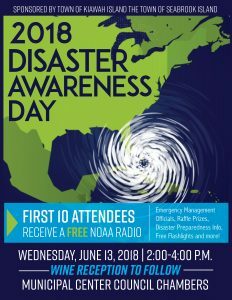 Please plan to attend the Disaster Awareness Day on Wednesday, June 13, 2018, from 2:00 – 4:00 p.m. at the Kiawah Island Municipal Center. Co-sponsored by the Town of Kiawah Island and Town of Seabrook Island. This year’s program will focus on hurricane preparedness covering preparation, evacuation, and return. Valuable prizes will be raffled off throughout the event with the opportunity to win an Amazon Echo! First ten attendees will receive a free NOAA weather radio. Complimentary wine reception from 4:00-5:30 p.m. No RSVP required. Don’t miss an opportunity to get a crash course in hurricane preparedness and learn how our community will handle a hurricane scenario. It’s also a great opportunity for residents to speak to our emergency management officials in one place. For more information contact Stephanie Braswell at sbraswell@www.kiawahisland.org or by calling 843-768-5113.